Michigan's wetland statute, Part 303, Wetlands Protection, of the Natural Resources and Environmental Protection Act, 1994 PA 451, as amended, defines a wetland as "land characterized by the presence of water at a frequency and duration sufficient to support, and that under normal circumstances does support, wetland vegetation or aquatic life, and is commonly referred to as a bog, swamp, or marsh." The definition applies to public and private lands regardless of zoning or ownership. Most people are familiar with the cattail or lily pad wetland found in areas with standing water, but wetlands can also be grassy meadows, shrubby fields, or mature forests. 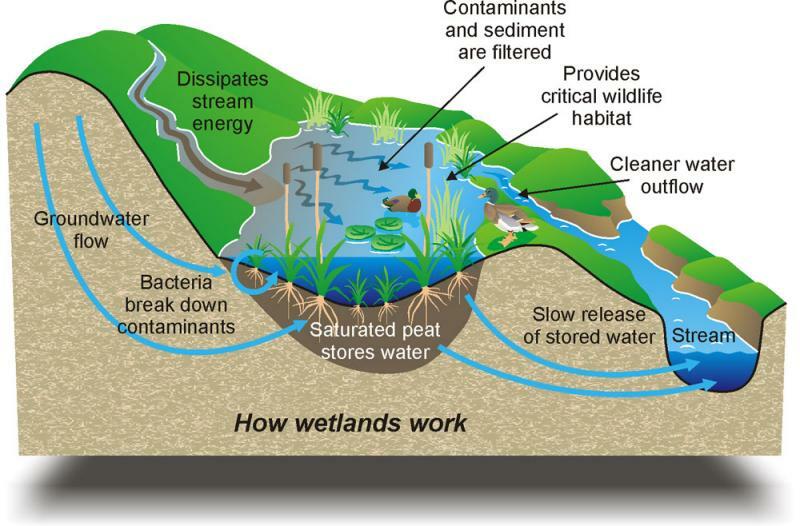 Many wetland areas have only a high ground water table and standing water may not be visible. Types of wetlands include deciduous swamps, wet meadows, emergent marshes, conifer swamps, wet prairies, shrub-scrub swamps, fens, and bogs. Flood and storm control by the hydrologic absorption and storage capacity of wetlands. Wildlife habitat by providing breeding, nesting, and feeding grounds and cover for many forms of wildlife, waterfowl, including migratory waterfowl, and rare, threatened, or endangered wildlife species. Protection of subsurface water resources and provision of valuable watersheds and recharging ground water supplies. Pollution treatment by serving as a biological and chemical oxidation basin. Erosion control by serving as a sedimentation area and filtering basin, absorbing silt and organic matter. Sources of nutrients in water food cycles and nursery grounds and sanctuaries for fish. These benefits, often referred to as wetland functions and values, often play a vital role in recreation, tourism, and the economy in Michigan. According to a 1991 United States Fish and Wildlife Service Wetland Status and Trends report, over 50% of Michigan's original wetlands have been drained or filled, thereby making the protection of remaining wetlands that much more important. This page last updated on 5/14/2015.